Is successful leadership measured simply by the outcomes a leader achieves, or is there another—more essential—yardstick for measuring success? 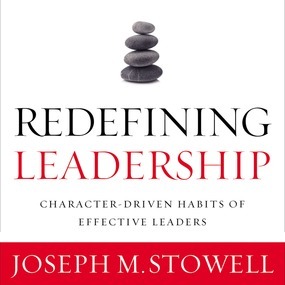 In Redefining Leadership, author, pastor, and college president Joe Stowell shows us that the best leaders are driven by Christ-formed character, and that truly successful leadership is not defined by the standards of this world but by the counter-intuitive practices and perspectives of the Kingdom of Christ. With compelling personal stories and insights from the Bible, he highlights the contrast between these two radically different leadership styles and demonstrates that the teaching and example of King Jesus, the world’s most unlikely leader, is the only model of leadership that leads to maximum results, results that will have an eternal impact.